Home >> News >> LE Graphics involved in first urban e-commerce deliveries by drone in Helsinki, Finland. 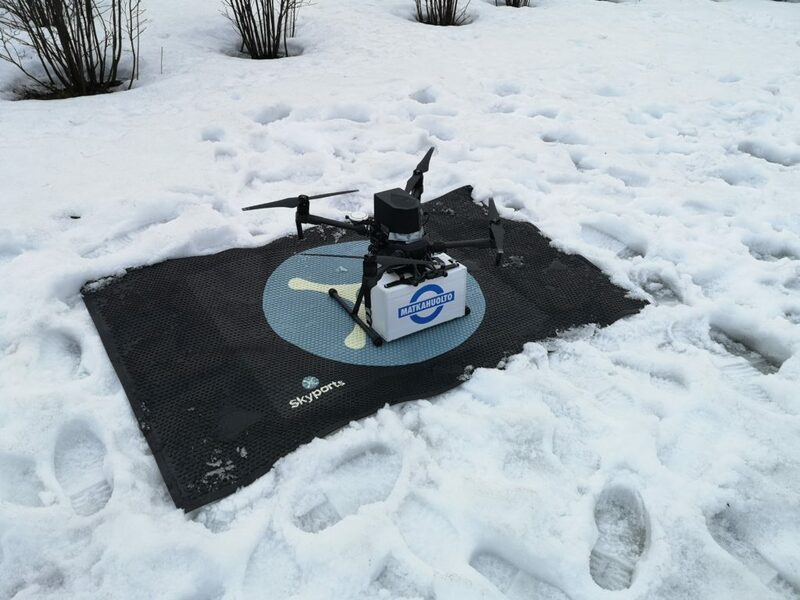 From Monday 18 to Wednesday 20 March, UK-based drone infrastructure firm Skyports were involved in giving consumers living in Vantaa, Finland, the chance to have their parcels delivered by drone in ground-breaking trials. These e-commerce deliveries were one of the first to take place in an urban environment and in the immediate vicinity of a major international airport. 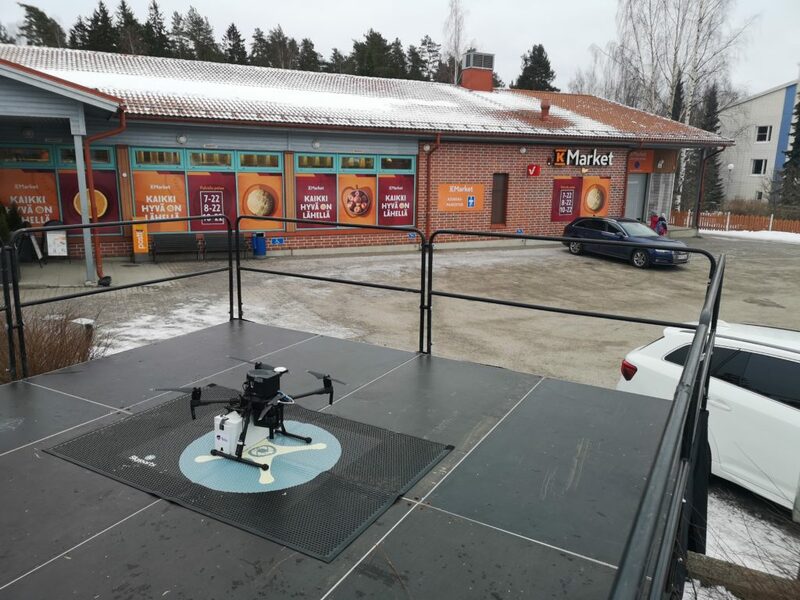 During the three-day trials involving around 100 drone deliveries of parcels weighing up to 1.5 kilos, some consumers that normally picked up their online orders in the K-Market supermarkets of Ylästö and Kartanonkoski were able to have their packages delivered by drone. 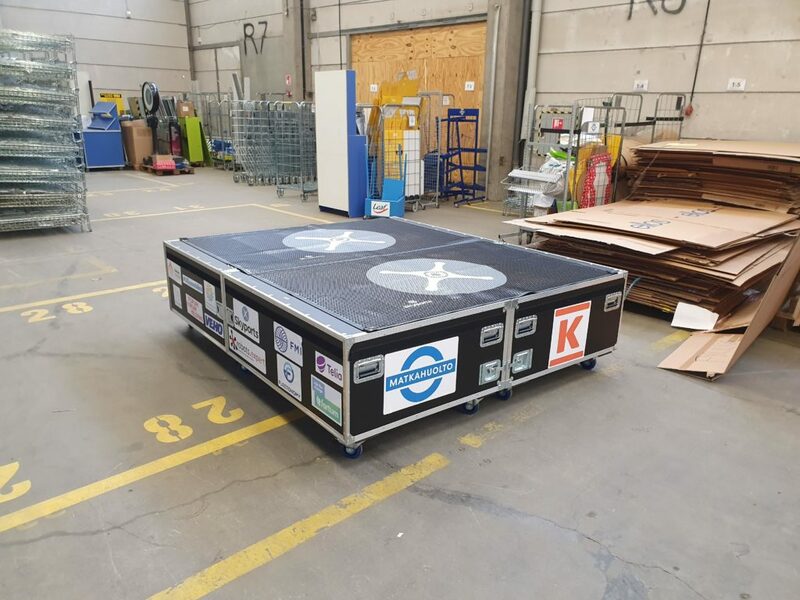 Selected customers were able to pick up their parcel as soon as the had landed on the dedicated Skyports landing platform – known as a vertiport – positioned in the parking lot of the supermarket. This is where local firm LE Graphics were involved. Skyports required a landing surface that would provide grip to the drones when landing in cross winds and extreme weather conditions and which could be clearly branded as a vertiport landing zone. LE Graphics provided Skyports with a series of mats from their outdoor rubber mats range which were supplied branded with the Skyports logo. The parcels being transported took off from a Skyports vertiport located at the Matkahuolto distribution terminal adjacent to Helsinki airport and travelled five kilometres to the supermarket where they landed autonomously on another Skyports vertiport. 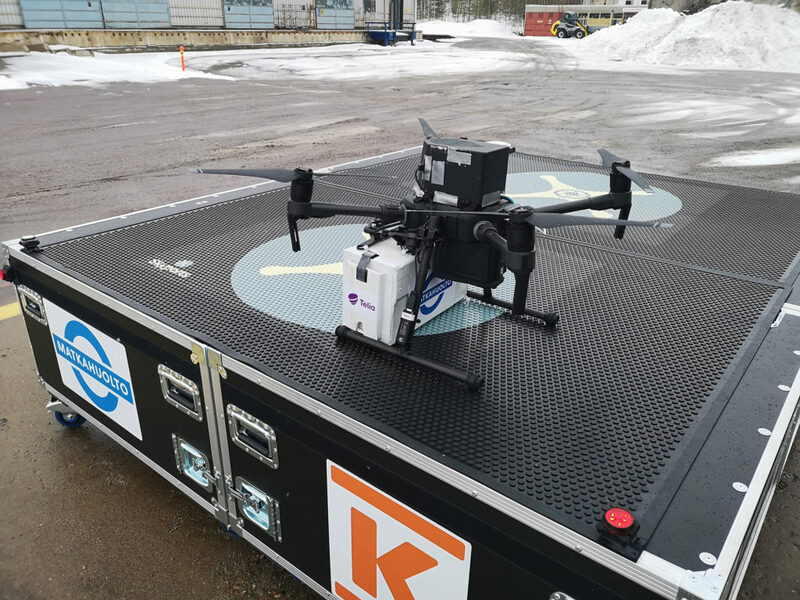 Each of the drone flights were fully automated with the flight control center located 14 kilometres away in the center of Helsinki, overseen by a fully qualified commercial drone operator. 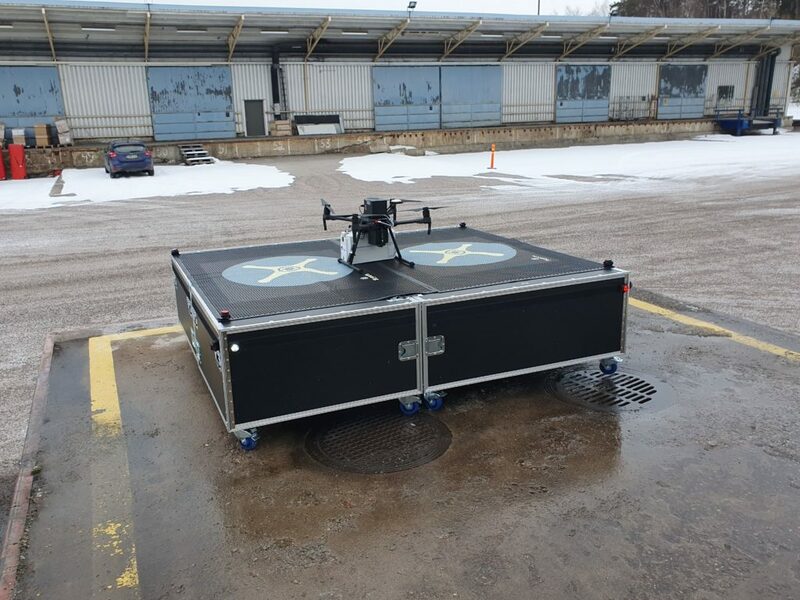 As part of the project, dedicated Skyports staff were present at both the Matkahuolto terminal and the supermarkets to supervise drone operations and ensure safety. The deliveries took place in the Aviapolis area of Vantaa. This location is the official market testing area of the Finnish Traffic lab. The market testing area is utilised to test new and innovative mobility solutions of which cargo drone deliveries is one example. The testing program aimed to demonstrate that cargo drones can provide a sustainable and more efficient alternative to road transportation and can be seamlessly and safely integrated into the urban traffic system. The mats used for the Vertiport surface are made from 100% Nitrile EXS Rubber which is resistant to chemicals, greases and oils. Photographic quality images can be printed on thermoplastic material and are moulded into the rubber. The mats provide good anti-fatigue properties and are ideal for outside entrances, inclines, restaurants, production areas and locker rooms.